As part of the countdown to the Week of Hockey Stars in Astana, we shall be taking a nostalgic look back at the nine previous All-Star Games, beginning – surprise, surpise – with the very first, a legendary confrontation between Team Jagr and Team Yashin, played out on one of the world's most glamorous stages – Moscow's Red Square. 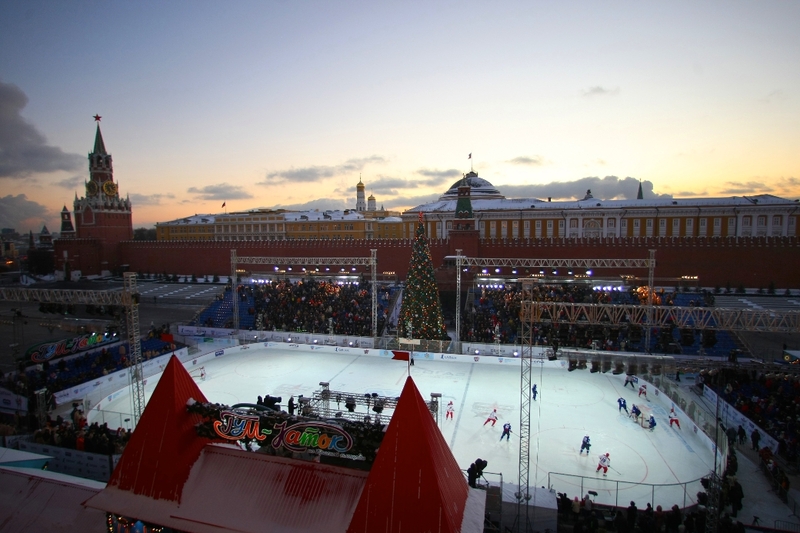 The choice of venue for the showcase event of the fledging Kontinental Hockey League was an inspired one: Red Square, heart of Moscow, flanked by the Kremlin and GUM, with a cathedral (Saint Basil's, Kazan) at each end, and one of the most famous patches of pavement on the face of the earth. The year before, a last Russian Super League All-Star Game, staged in Mytischi out in Moscow Region, had by all accounts been a drab and forgettable affair, and the new League decided that a revolutionary approach was needed. Innovations often lead to teething troubles, but the KHL's superb level of organization for these occasions was already apparent, and the event passed almost without a hitch. “Almost” because there was one problem, and it was supplied by Mother Nature. 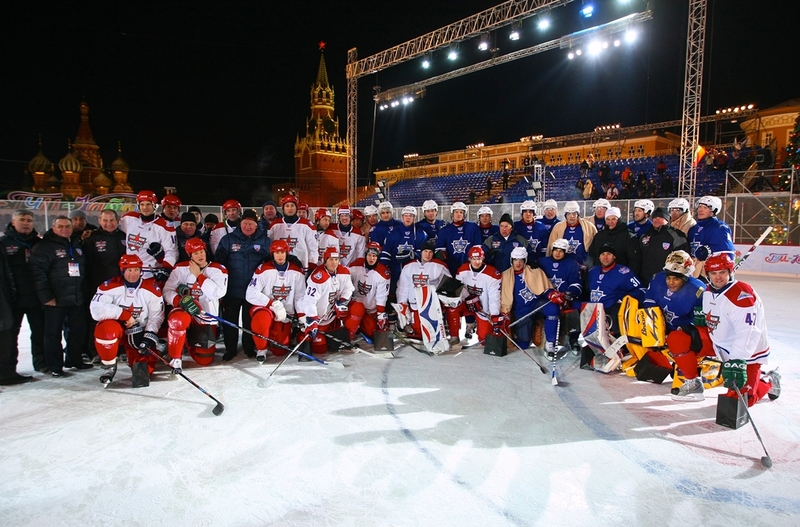 The temperature on this January evening dipped to -15C, more typical of Siberia or Murmansk than Moscow, but the fans who braved the cold enjoyed the festivities nonetheless, while the world's media was full of striking images of the stars of this new League playing against a backdrop of the stars adorning the Kremlin. Yashin vs Jagr. Russia against Czechoslovakia? Another unique feature of the first KHL All-Star Game was the format. Instead of the now-familiar Eastern-versus-Western-Conference confrontation, we had the home-grown Russians of Team Yashin taking on the International Brigade selected for Team Jagr. Alexei Yashin's Russians boasted such names as Alexander Radulov, Alexei Morozov, and Maxim Sushinsky, and were under the wise guidance of the master from Salavat Yulaev, Sergei Mikhalev, assisted by CSKA pair Vyacheslav Bykov and Igor Zakharkin. Jaromir Jagr's Rest-of-the-World roster was led by the USA’s Barry Smith (SKA Saint Petersburg), backed by Kari Heikkila (Lokomotiv) and Vladimir Vujtek (Dynamo Moscow). Despite the presence in Team Jagr of top-class Canadians, Swedes, Finns and Americans, the limelight and the headlines were grabbed by Jaromir's current and former compatriots: Czechs Jan Marek and Jaroslav Kudrna each scored a goal, while Slovakia's Marcel Hossa hit a hat-trick. Many even remarked that the match resembled a Russia-versus-Czechoslovakia encounter, with no fewer than eight Team Jagr players plus assistant coach Vladimir Vujtek hailing from the Czech or Slovak lands. Jagr's men raced to a 3-1 and then a 4-2 lead, before a stirring fightback by Yashin's men, led by the fearsome Radulov-Saprykin duo, had the Russians leading 6-5 with just minutes remaining, before Jagr's men rallied again, leveled, and with under a minute left on the clock, Hossa's hat-trick goal sealed a 7-6 triumph. Who else played on Red Square? Recent Loomotiv boss Alexei Kudashov, once a center for the Maple Leafs, and Andrei Nikolishin, former left-winger with the Whalers, Capitals, Avalanche and Blackhawks (where he is now a scout) were both at the twilight of their playing careers, as was former Flyers and Coyotes goalie Robert Esche, but many others still had their best years ahead of them: Danis Zaripov, Alexei Tereshchenko, Ilya Nikulin, Kevin Dallman, Tony Martensson, Ray Emery, who was to win the Stanley Cup with the Chicago Blackhawks a mere four years later,and of course, Sergei Mozyakin, who scored two of Team Yashin's first three goals and who has been an ever-present at the event to this day. The following year's All-Star Game was to be held in Minsk, but to the Red Square event came a contingent of hardy fans from Belarus, who made the long journey to cheer on just two players: their compatriot, veteran forward Oleg Antonenko, who was plying his trade for HC MVD, and Dinamo Minsk's USA international Ben Clymer, who had won the Stanley Cup with the Tampa Bay Lightning half-a-decade earlier and who had racked up over 500 appearances in the NHL. Clymer gave them an early cheer by scoring the go-ahead goal to give Team Jagr a 2-1 lead midway through the first period, and a year later Ben hung up his skates. Fewer Master Show events, but many fond memories. For the tenth season, the KHL is staging a whole Week Of Hockey Stars, but back in 2009 the open-air conditions dictated an understandable need to cram into a few hours the All-Star Game and Master Show, and the latter was compressed as a result. But the competition still included the beloved Shootout (with Danis Zaripov the first ever victor), the Shooting Accuracy (won by the current YHL Managing Director, Alexei Morozov), and the Fastest Skater (won by Alexander Radulov, freshly back from the NHL), and the overall result - a 6-1 victory for Team Yashin – no doubt helped soothe the pain of defeat in the big match. The first All-Star Game in the history of the League was not a tale of perfection – only around 3,000 people braved the biting cold to watch from the stands, and the stars themselves were less than happy with the playing surface - but all who took part harbor fond memories of the open-air extravaganza, which brought memories of childhood hockey flooding back, and more than made up for Jack Frost's presence in the locker rooms.